At Lighthaven fountain search for an NPC called Vincent Swiftblade. Talk to him and he will say that he needs a group of heroes to make a coordinated assault on three different camps. Say "Olin Haad", "Tarnian Wolfmane", "Yes", "Details" and he will give you more details of your task. Follow the path east (turns west) until it ends. Continue walking west and you will end up at some abandoned houses. Find Mercenary Leader and kill him. Head back to Vincent Swiftblade. Go to the Great Library (east from Raven Dust crypt entrance) and speak with Filandrius. Say "Foreign magic", "Need", "Filnar'thir", "Darkness", "Get it" and he will send you to kill Anthor the Mad and get the Tome of Arcane Knowledge. Head to Windhowl and talk to the Windhowl Sentry (located at Windhowl gates). Say "Help" and he will tell you that behind the Windhowl gates, lies Hel, Arakas' Harvester of Life. Search for her (it's a non seraph NPC) and click on her until she becomes an evil seraph NPC. Kill her and you will receive the Hel's Soulstone. Return to Windhowl Sentry and say "Reward" to him. You will receive 100*level experience points and 500*level gold pieces. Then head to Filandrius (located at the Great Library). He will recognize the Hel's Soulstone and he will mention that it's interesting. Say "Interesting", "Countless riches", "Soulstones", "Names" and he will give you the names of the three guardians. The are called Jormungand, Hel and Fenrir. He will also mention that once you have found the three soulstones head to Centaur Village and find a portal. Now head to Zhakar's Tower. Go west and pass over the Stonehenge. Follow the mountain line and turn east at the first mountain opening. Continue east and you will find Jormungand, Raven's Dust's Harvester of Life. Jormungand looks like an evil seraph. Kill him and you will receive the Jormungand's Soulstone. You will notice that in all towns (and not only) there are portals. You can access them only if you are a Seraph. 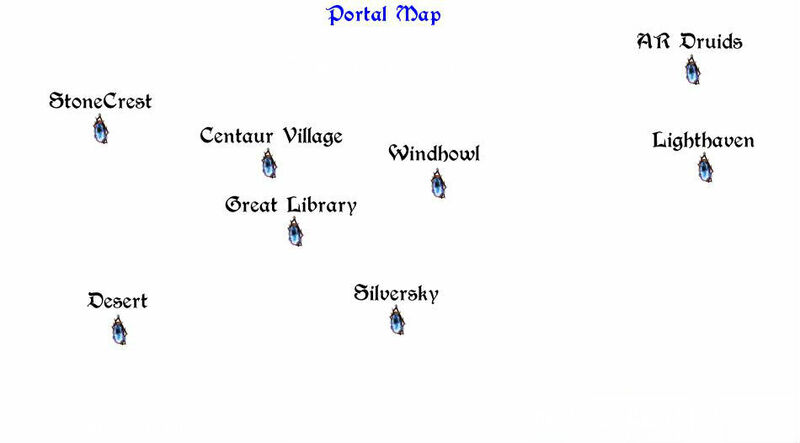 The portals are located in Lighthaven, Windhowl, Arakas Druids, Silversky, Raven Dust Oasis, Raven Dust Library, Stonecrest and Stoneheim Centaurs. Approach a portal and click on it. Say "Creations", "Stop", "Yes". You step through the portal and appear somewhere else. You have around 30-60 seconds to kill Doppelganger. Enter all 8 portals and kill the Doppelgangers. You cannot go back into a portal you have beaten until you finish all eight. Complete it and you will have access to Plane Walking (which means you can access the portals and travel to destinations at any time you want). This map shows which portal travels you where. Note: The easiest way to kill Doppelgangers, even for mages, is with weapons. You can also activate your Armlet of Flames and your offensive shields. Spells, unless you're level 150+, will do nothing to him. Go east and follow the path that is heading to spiders. Just before you see spiders you will see a small camp with Obsidian Conclave Knights. Attack and kill about 10 of them until their commander spawns. Kill Commander Mordred and you will find a small iron key. With the key, open the chest that is located near the camp. You will find the Celestial Plate.